Trina Lacy knew all about survival. Since her accident, she has been determined never to feel like a victim, but live life as a survivor. Her classmate, Mark Jacobs did not think he deserved to be a survivor. Plagued by guilt for his role in his parent’s death, he felt life was not so great. Trina’s ex-boyfriend Lucas James felt guilty for the accident he caused that left his former girlfriend scarred. When Trina proposes a fundraiser to be held at Windows on the World for their community service project Lucas and Mark jump at the chance to help. Each of them has their own reasons. Once in the Towers, they decide to divide and conquer. They had not expected someone to fly planes into the Towers. They never expected to face escaping the burning towers with all the odds stacked against them. Now the fears they have been carrying with them must be dealt with as they take steps to get out. The question is, will they survive the events of 9/11? 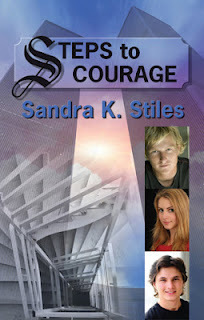 Steps to Courage is one of my favorite books to read because it was a thrilling and scary story. I think you should read it because it tells you a little about history and is a really thrilling book. It is about three kids and what and where they were when 9/11 happened. This is why I think you should read and enjoy this book!